Why should you be in this Program? Click here. 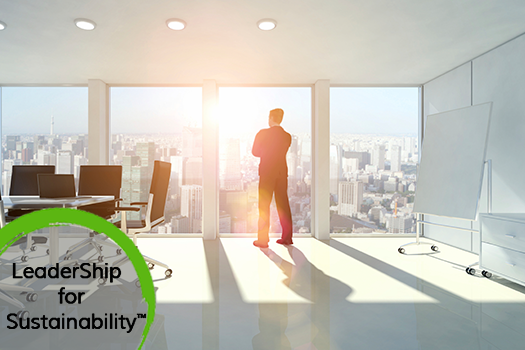 LeaderShip for Sustainability™ is a highly acclaimed, groundbreaking program where leaders learn to translate sustainability goals into tangible business results. This program is for executives and managers who will lead their businesses successfully into a future that’s built on a triple-bottom-line foundation: People thriving, while producing Profits within the resource boundaries of our sustaining Planet. Today we face an urgent need to transition to a green economy. Leaders and managers in all functions have crucial roles to play in building essential organizational capabilities of sustainable prosperity, now into the future. To grasp the breadth and depth of the leadership capacities and skills required in a triple-bottom-line world, this intensive, interactive program integrates the GlobStrat Academy’s triple-bottom-line strategic business simulation’s multi-player team competitions with business-focused insights and sustainability frameworks. LeaderShip for Sustainability is designed to engage all disciplines of an organization collaboratively: finance, manufacturing and operations, research and development, sales and marketing, and human resources, along with environmental, health, and safety, corporate social responsibility. What makes this program unique? It focuses on developing leadership that fully integrates sustainability into every aspect of your company, including the critically important people side of your business. This proven combination prepares leadership to successfully meet real business challenges and opportunities sustainably. Learn more: Download our LeaderShip for Sustainability Overview Brochure.